Tonight while watching the Big Break PEI, I was really shocked to hear Aaron call himself a “coward” when his chip shot came up short in his playoff against Derek. As an ex-Marine who is both physically and mentally strong, hearing him say that word really threw me. It’s like that “S” word in golf – shhh…you never say it. And likewise, Marines don’t call themselves the “C” word, right? And let’s not forget that at the 1992 U.S. 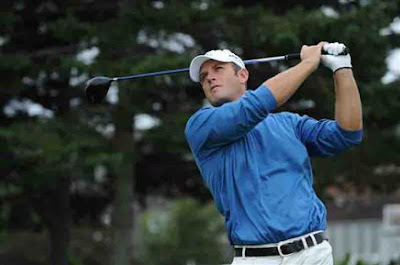 Junior Amateur, Wright played against Tiger Woods. If that doesn’t make you strong, I’m not sure what would! Hmmm…now that really made me think. How does one become mentally strong on the golf course and keep that strength focused on the target? I then had to ask Brenda if she was fed up hearing things like “Luck of the Irish” and “Oh, she extracted the rabbit from the hat on that one.” When were people going to recognize that this woman can play golf? Okay okay…that first chunk and run was a bit lucky, but those putts weren’t. Sorry I won’t have any other interviews this week because I’m off to PEI first thing in the morning and will be playing the Rodd Miller River golf course on Wed. I am so excited to see and play the holes where all the challenges were played on the Big Break PEI. Stay tuned for my posts on that experience and the other courses I’ll be playing while I’m there (Dundarave Golf Course & Links at Crowbush Cove). I keep hearing that PEI’s a golfer’s paradise in the summer on PEI – I can’t wait to experience it for myself. I work on behalf of Tourism Prince Edward Island and we just launched our new site where people can share their travel stories – http://www.shareyourpei.com. I thought you might be interested in letting other travellers know about your experiences on the Island. We’d love to hear them!